Okay, so for those of you who are looking for a February race and aren't doing Princess at Disney either, perhaps you might want to look into one of these (for this year or in the future). 1. Phoenix Arizona- Marathon, Half marathon, or 10K - I hear this is a pretty flat and easy course. One fun fact about this race is that even the spectators can win prize money for motivating the runners! 2. Fort Lauderdale Florida - Marathon , Half marathon, 6k and 5k - This is Boston qualifying course. If you are visiting Florida (or live there), this may be a great alternative to running the Disney Princess race. I hear it doesn't sell out as fast. 3. Speaking of Alternative to Princess weekend. If you don't want to be a Princess you can be a Pirate. I 've already had several runner friends that have passed on the Disney Princess races to run the Gasparilla Races in Tampa, Florida. There is a variety of distances (including half marathon through 5k), and I hear the theming is great and the organization puts on a fantastic weekend for only half the price of Disney. 4. If you love donuts than perhaps the Krispy Kreme Challenge is for you! This is a 5 mile race held in North Carolina. The challenge is that you have to eat a dozen donuts while out on the course! That's right 12 donuts. I almost gag at the thought of ONE Krispy Kreme donut let alone 12 of them. Needless to say this is one race I will NOT be participating in, but it's in February and I'm sure some people would be up for the challenge so I included it. I got this cool medal in the mail last week. It seems silly that I am getting a medal for only doing 2.14 miles, but hey I guess it's motivation to get out there in the cold! It actually is magnetic and the top opens off just like a box of chocolates! I do have to say that I LOVE this shirt! I don't have a Valentines day theme running shirt so I was very excited to add this one to my collection! And speaking of Valentines theme runs. We are sad to hear that the J &A Race For the Love of Running is no longer being put on. Those of you that are familiar with the J &A Races or the Virginia Beach area may remember that race. It was a 14K. It was pretty cold the year my sister ran it so maybe it has lost it's appeal to runner? What is on your race calendar for February? I bet it will actually be really nice for you to be at Disney and not race. Time for you to really enjoy it and relax. I can understand why they eliminated that 14K. The weather is not the best anyway! Our Triple Crown of running starts in February - excited about the running season kicking off. Sounds like a lot of fun races! I have just started training, so no races in February for me. No "real" races for me either! 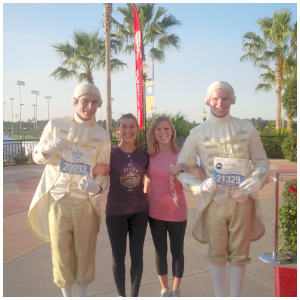 im actually doing the gasparilla half this year instead of princess. time to mix things up and my good friend lives in Tampa and she is running it with me. In Houston there is the Rytham and Blues Half Marathon and I hear they give great swap but Ive never actually run that race yet because of princess in years past. Yay AZ made the list. The Phx Marathon is a great event. I love the course plus our weather is typically amazing around that time of year. I've heard good things about Gasparilla! Maybe one year I will try it. We are doing the Missions race in San Antonio in February - they have a marathon/half/10k/5k, so something for everyone. You get to run through the historic missions, which sounds pretty cool. Another option for a February race is the Austin marathon/half marathon. I don't have any races on the calendar for February--I'm getting in gear for my March half in Sarasota and of course, Big Sur in April. Will you be sad being a Disney and not participating? I think that would be hard! A relaxing trip to Disney world sounds fabulous, have a great time next month! Thinking back to February races, RnR New Orleans was a good one to run as well during the month. phoenix is a beautiful area to run, a great choice on your list!!! I decided to do Princess again-I couldnt pass up earning the pink coast to coast! I will also be running the LA Marathon on Valentine's Day this year-the Olympic trials are the day before so it should be a great weekend! I'd love to do the Coronado 10k one year. This year it's on Valentine's Day since it's a Sunday. There's a 10k, 5k and 1 mile run. And I forgot, the Cowtown series in Fort Worth is at the end of February. I'll have to looks those up! O dang! I'm so sorry. I guess it's a popular one! I'll be doing a virtual race in February- The Zooma Run Love Challenge. (a 10k). I'm kind of glad I haven't signed up for any real races with the weather being so unpredictable! I totally understand that. Unless I'm going to a warm climate I wouldn't enter any races more than a 5k (and that might even be pushing it)! Hope you have a great non-race trip to Disney! I'm sure it'll be nice to enjoy time there without having to work around early morning wake up calls. There are several love themed races around here, but I'm opting not to participate in any of them this year. The only race I'll be doing in February is the ZOOMA Run Love Virtual 5k, and I'm more than okay with that decision. The Krispy Kreme Challenge has been on my bucket list for YEARS. I really need to make it happen. Running and KK put together...it's a match made in my version of heaven. I've got a 5k and a shakeout run scheduled for February. I'm keeping it easy this spring! 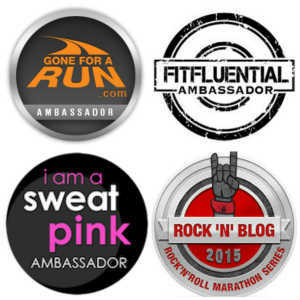 Love the swag for the virtual race! So sorry you dislike Princess so much. Why is that? I ran it in 2011 and had a great time. It was my first time back to WDW since 2000 and the race still felt like a race. I did the Glass Slipper Challenge in 2014 and swore I'd never do Princess again. The level of snark and nastiness was extreme. I'm a really slow runner and have a habit of under training and even I couldn't deal with the congestion and lack of race etiquette. It just feels extreme and that particular race. So rather than be annoyed, I just have decided to skip it for now. This race is very popular for newbies, which I'm TOTALLY fine with, but the groups of woman taking up a whole street by walking 5 or 6 abreast makes me ragey. I'd much rather do Marathon weekend. I'm doing Tinkerbell for the first time this year since its inaugural year (it was amazing then) and I'm really hoping it's not like Princess. I'm glad you are planning a relaxing trip instead - we all need a little R&R!